The Latest On SCARY STORIES TO TELL IN THE DARK! Guillermo del Toro will soon be bringing to life his vision of SCARY STORIES TO TELL IN THE DARK in the form of a movie. Based on the spooky book trilogy of the same name, the flick will be coming to theaters this August from CBS Films and Lionsgate. There is much speculation that a trailer will soon be here. Starring Zoe Colletti, Michael Garza, Gabriel Rush, Austin Abrams, Dean Norris, Gil Bellows, Lorraine Toussaint, Austin Zajur, and Natalie Ganzhorn. 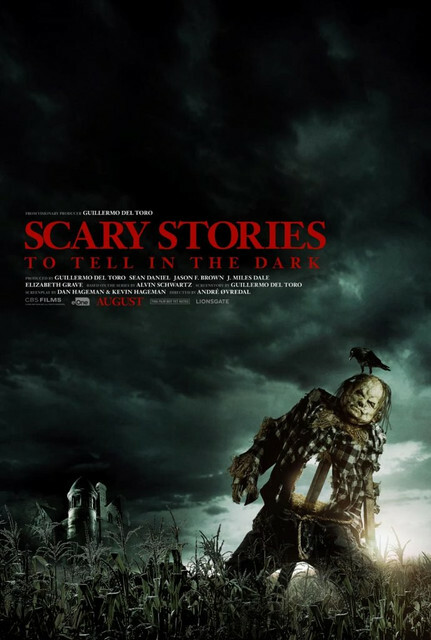 SCARY STORIES TO TELL IN THE DARK is produced by Sean Daniel, Elizabeth Grave, Guillermo del Toro, Jason F. Brown, and J. Miles Dale. "Inspired by one of the most terrifying children’s book series of all time, SCARY STORIES TO TELL IN THE DARK follows a group of young teens who must solve the mystery surrounding sudden and macabre deaths in their small town." In addition to the new movie, a documentary which will follow SCARY STORIES TO TELL IN THE DARK will be coming out sometime this year. SCARY STORIES TO TELL IN THE DARK will arrive in theaters August 9th, 2019.